Green senior Tayte Carver was joined in celebration by his teammates after scoring his 1000th career point. Trojans senior point guard Danny Lattimore finished Wednesday’s win over Green with 14 points and 9 assists. 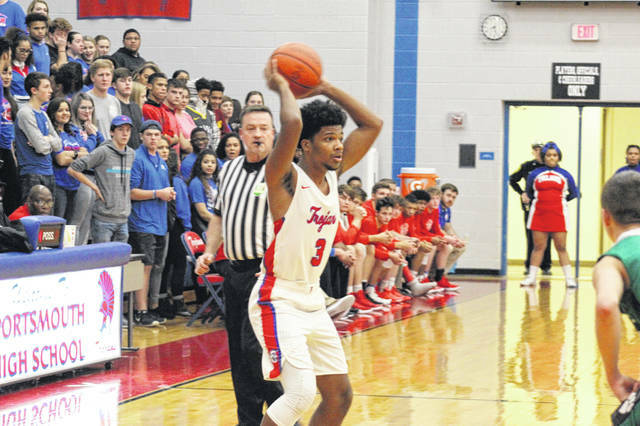 PORTSMOUTH – It wouldn’t be a basketball season if the Portsmouth Trojans weren’t playing a great brand of basketball in the early stages of the year. 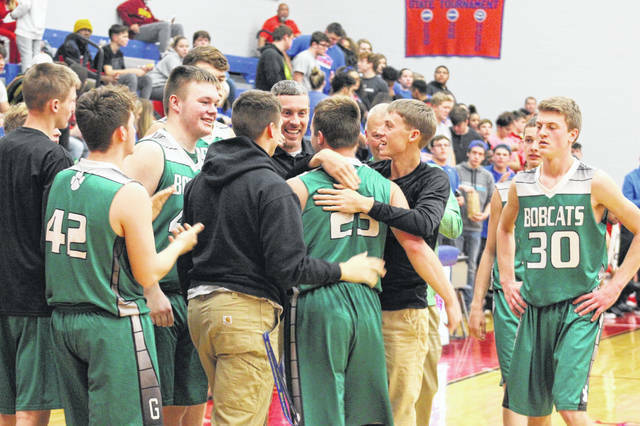 That’s exactly what they showed in a 78-46 win over a limited SOC and Scioto County foe Green on Wednesday on the opening night of the Buckeye Elite National Showcase held on the Trojans home court. Yes, the Bobcats were with out two of their starters, Tanner Kimbler and Gage Sampson, but they were able to hang tight with the Trojans for a good portion of the first three quarters. Ultimately, Portsmouth’s athleticism and scoring led by junior guard Matthew Fraulini proved too much to handle in the Bobcats second game in as many days. Both sides had a number of great looks on the offensive end in the first quarter, but the Trojans managed to edge out a 20-18 lead going into the second, one in which they wouldn’t look back from. A big reason Portsmouth had a 41-30 lead going into the second quarter was the play of Fraulini who had 15 at the break. Green would do a better job in the second half defending Fraulini, limiting him to just 7 second half points, giving the junior guard a game high 22 points in his 2018-19 home opening game. Another bright spot for the Trojans offensively was Danny Lattimore. The senior guard, who was also the starting quarterback for the Trojans football team, had 14 points and 9 assists in his first home game leading the offense from the starting role, something Collins was pleased to see from one of his senior leaders. The other players who led the Trojans were senior Myquel McKinley who had the second highest number of points on his team with 16, as well as Myles Shipp who contributed 12 points from the inside. With two starters out for the game, leading the Bobcats in scoring was Tayte Carver with 13 points and Caden Blizzard with 10 points. Carver was sitting on 999 career points with his 9 points entering the halftime break. But with 5:56 left in the third quarter., Carver scored again to break the 1,000th point mark for his career, a moment in which the senior guard is likely to not soon forget. The Trojans will prepare for a quick turnaround on Thursday when the will host Huntington St. Joe on Thursday in the lone Thursday game of the Buckeye Elite National Showcase on their home court. The Bobcats will get ready for their home opener on Friday night after three straight road games against OVC opponents. Their home opener will be against the Clay Panthers as both teams will look to get a win in their opening game of their SOC I slate.